A Texas Hill country resort on the shores of constant level lake LBJ offering magnificent sunsets and peaceful surroundings. Close to Austin, Fredericksburg & San Antonio. Enjoy a luxury site and private boat slip today. They do not allow full timers to reside there except for staff members. Thank you! Hard to find a lot of parks that do not allow full timers. My wife and I just wanted a long weekend away from town. The grounds are well kept and the staff was very friendly. Town is a little far away, and boat traffic a little busy. Other than that, I recommend this for a quiet getaway. The hike onto the large granite slab at the end of the park is interesting, to say the least. What a GREAT RV park! Very friendly and helpful staff who obviously care deeply about maintaining a first class facility. 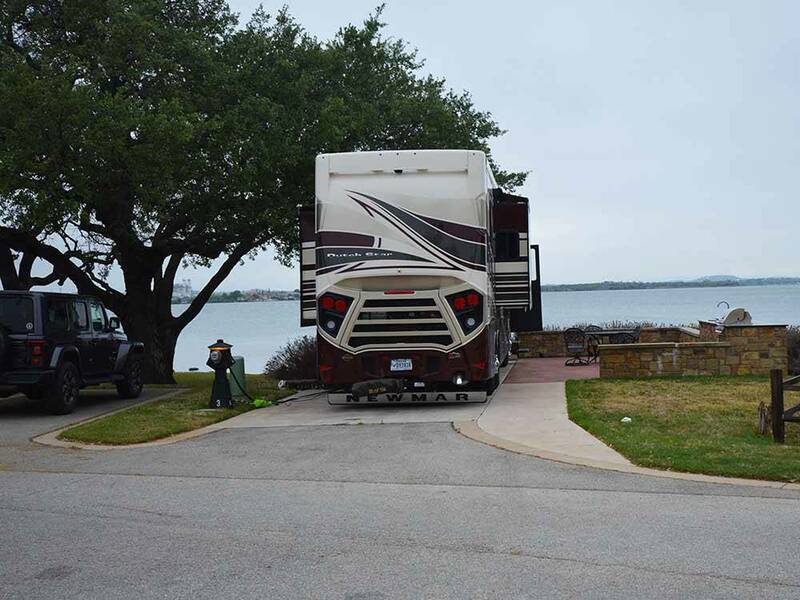 Superb restrooms and spacious, paved RV sites, well separated from one another. Park is very safe and secure. This is a beautiful location. We would stay again in a heartbeat! This RV Park is very nice. Gated access provides a very exclusive park with gates closing at 4pm. The park is right on LBJ lake and has a nice area roped off for swimming. The facility is quite clean and well kept. Internet and TV service provided is okay, but not particularly fast. The main reason I did not rate this 5 stars was that the price was a bit high for the services provided. If price is not a concern, this is a great choice to spend some time relaxing. Attended a chapter rally and needed to leave after one night due to my mother passing away. I asked the manager to refund 3 unused nights and he agreed, but he could not do the credit at that time. I trusted he would do it, but 12 days later I called him to check on the credit and he told me that it was against their policy to refund, even if you have to leave for a family death. So he lied to me when I asked him before I left the park. The manager obviously cares more about his bottom line than he does about you. Just so you know if you choose to give him your business. Wow, this RV site is possibly the nicest we have ever camped at. This is a gated campground, the code for the gate given to registered guests. It was almost surgically clean. The camp area for almost all sites are concrete pads surrounded by well manicured grass. Most of the sites have a view of the lake. As we did not have a reservation we were offered one of these sites for two days, but would have to move to their "overflow" area for the remaining two days of our stay. We chose to just stay at the over flow area for the entire time. Although not a concrete pad, it was a very well maintained, tree shaded huge graveled area. As a bonus we had that area all to ourselves, no neighbors. The restrooms and showers were immaculate. The staff were friendly, courteous, and always available. 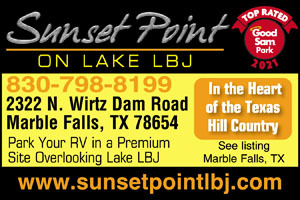 Sunset Point will be our first choice whenever we travel to the Marble Falls area. Highly recommend to others! We've stayed at this resort twice. We found the staff pleasant and the park well maintained. It is right on the lake, so perfect for boaters. It's convenient to the city of Marble Falls (and the Blue Bonnet Cafe with its wonderful pies), and our daughter's sleep away camp. We are already planning on stay here again next summer. Enjoy magnificent sunsets in the Texas Hill Country on the shores of beautiful Lake LBJ. Nestled on 20 gorgeous acres with almost a mile of prime shoreline offering premium waterfront sites, boat launch and boat slips.